Apply for our 2019 scholarship. When you apply for and are awarded a scholarship from our scholarship fund you receive philanthropic dollars to support your pursuit of a career in the nursing or allied healthcare professions. Scholarship applications are available annually starting in February and are due in April. Be accepted into an accredited nursing or allied healthcare profession program and successfully complete one semester before funding is awarded. Other criteria as determined by the Scholarship Committee. Our endowed scholarship fund provided $37,725 in educational support in 2018. The fund comprises a number of scholarships originally established to support the Concord Hospital School of Nursing, which closed in 1989. It reflects the goals and intentions of donors to the original School of Nursing. 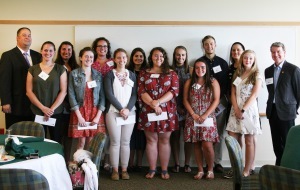 This faithful group of supporters inspired and enabled students to pursue careers in the nursing and allied healthcare professions to enrich their lives, while ensuring the continued availability of quality health care for our community. Today, a volunteer committee comprised of medical professionals, Concord Hospital employees and community members oversee all aspects of our scholarship fund. Our volunteer Scholarship Committee is comprised of medical professionals, Concord Hospital employees and community members.